Most European regions have not yet seen a significant development of energy performance contracting (EPC). Apart from legal barriers, this can be attributed to the lack of understanding and trust in EPC and the absence of experienced ESCOs and organisations facilitating the EPC market development. Street lighting is a good "learning and testing ground" for EPC due to its lower technical and economic complexity (compared to building-related EPC). 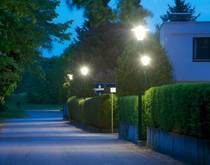 Furthermore, the recent market introduction of LED technology for street lighting offers high energy and cost savings with comparatively short pay-back times. Energy performance contracting can be a very good solution to make street lighting refurbishment happen: guaranteed energy services in the form of EPC work best in cases of high energy and costs savings potentials. The project "STREETLIGHT-EPC" created demand and supply for EPC projects in 9 regions by setting up regional EPC facilitation services. These services provide comprehensive support to municipalities (street lighting operators) and SMEs as potential ESCOs. The project partners implemented more than 50 EPC street lighting projects in the project’s lifetime (April 2014 – March 2017). This helped to create knowledge and trust in both LED technologies and the EPC model. The project team included 9 regional agencies/organisations (providers of EPC facilitation services), 9 municipalities and a European network.